Just because we live in an electronic age, don't think we're not influenced by the oral tradition. "Urban legends", with their strange-but-true story lines thinly clothed in twentieth century details, have the power to elicit in us a response. 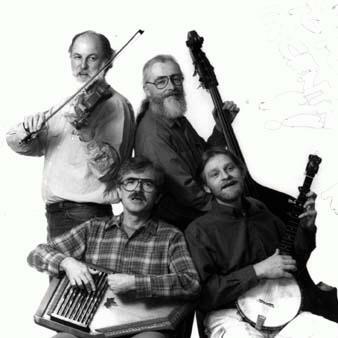 The Seneca Moon String Band is one of those "urban legends," despite the protagonists and performers coming from all over a wide geographical spread. Ask a Night Eagle regular about their performances: you'll first hear a chuckle, then an explanation that clearly requires seeing to believe. In very general terms, you can expect an eclectic collection of performers whose numbers vary. There are usually at least 5 musicians whose week-day alter egos include professionals and academics. Stage dressing with floor lamps and easy chairs help accomplish the transformation in the already extremely comfortable Night Eagle. They play the hits of the '60s, '70s, and '80s--1660s, 1770s, and 1880s, that is. Past perfomances have included stellar harp playing and a glass harp that I won't even begin to describe. This is the kind of music-making that offers good humor, joy in playing, and affection from the audience in equal doses. A Night Eagle favorite.